Step 1: Taco Bell sued because their “Edible Beef-like Taco Substance” contains only 35% meat, instead of the 40% required by law to call your product “beef” in the United States. Step 2: Taco Bell president publishes a letter saying “no, our product is 88% beef, and the other 12% is unicorn jerky”. beef: muscle tissue of a cow. “beef”: things that can be sold with the word “beef” on them, and apparently have to be 40% beef. “Edible Beef-like Taco Substance”: what Taco Bell serves. Step 3: I think to myself, 88% is a suspicious number. I mean, I have seen what comes in a Taco Bell taco, and it ain’t 88% cow, and claiming it is is a bit of a stretch. Step 4: Waitaminute… “beef” has to be 40% beef. 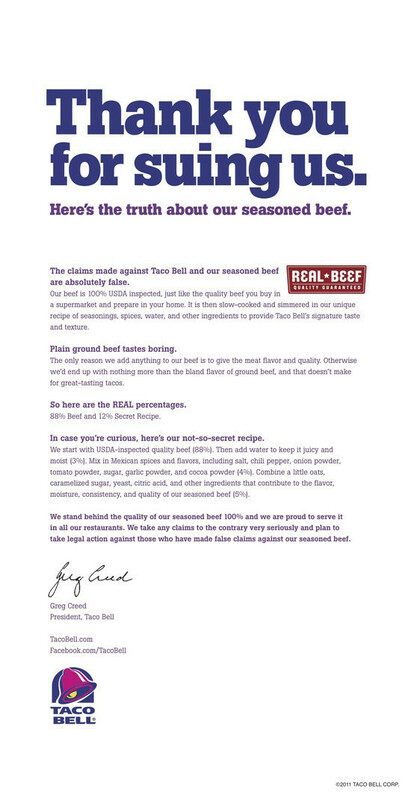 Is Taco Bell saying that their “Beef-like Taco Substance” is 88% “beef”, not actually 88% beef? But “beef” only has to be 40% beef. Okay, seriously… am I the only one with ears? I’m hardly an audiophile, but I’m increasingly finding new music unlistenable purely as a result of the loudness war. If you don’t know what that is, this YouTube video has an excellent description of loudness wars. I have songs that I don’t like listening to because I know there’s a better song in there somewhere: I just can’t hear it because all the interesting stuff has been clipped. Most recently, I found myself thinking that the Alicia Keys vocal Empire State of Mind is totally muddied. It would probably sound awesome if the vocal wasn’t squished in with everything else, but everything is too loud to let that happen. [You can certainly find it on your favourite file sharing service—don’t pay for it, it’s not worth it.] Most annoyingly, the video on youtube actually has better audio (to my ear at least) than the album version. Screw it. I’m just going to listen to Gordon over and over forever. I ripped it myself from a CD I bought sometime in the middle 90s and it sounds awesome.